Here’s our round-up of some of the best things going on in Cornwall over the next couple of months. 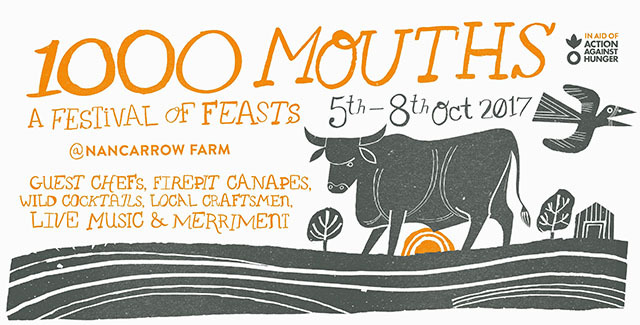 Not to be missed, Nancarrow Farm’s “Festival of Feasts” 1,000 Mouths, will take place over four evenings from 5 to 8 October. 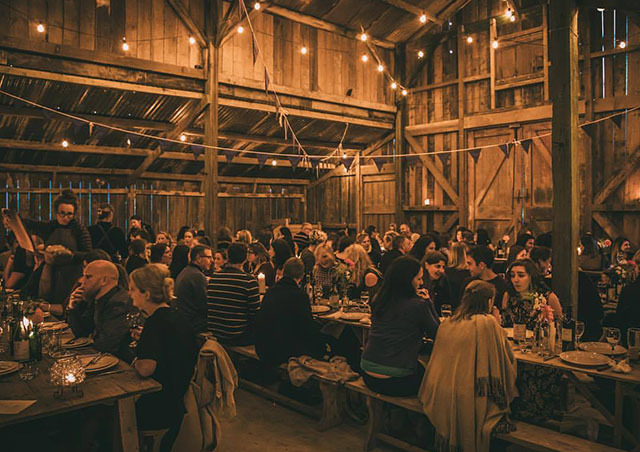 Some of the UK’s most inspirational chefs, producers and foragers (including a team from River Cottage, Gill Meller, Ben Tish, James Knappett, Andy Appleton, and Phillip Branch from Hawksmoor) will be joining Nancarrow chefs Darren and Jack to put on an incredible event. 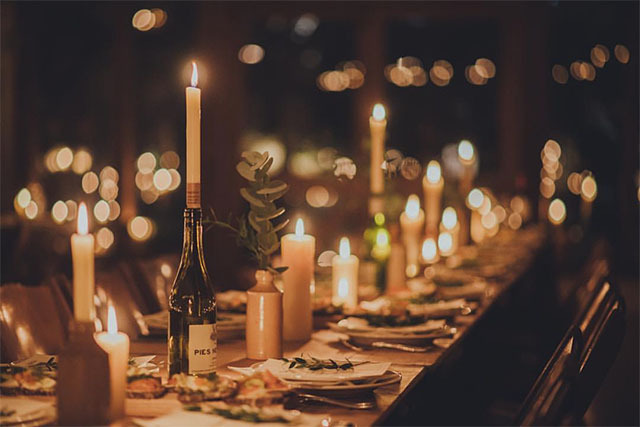 Over the four nights, the chefs will feed 1,000 people with the farm’s finest Red Devon beef, and guests will also be able to explore the farm, meet local craftspeople, sample campfire canapés and wild cocktails, and enjoy live music. On the Sunday, the event will start a little earlier, with a children/family ticket option. There will also be a bell tent hamlet on site, offering accommodation for those who would like to stay overnight, with a campfire breakfast included. The event will raise funds for Action Against Hunger and tickets are available to purchase online. Truro Arts Co. is hosting a charity art auction from 6.30pm on Thursday 5 October. 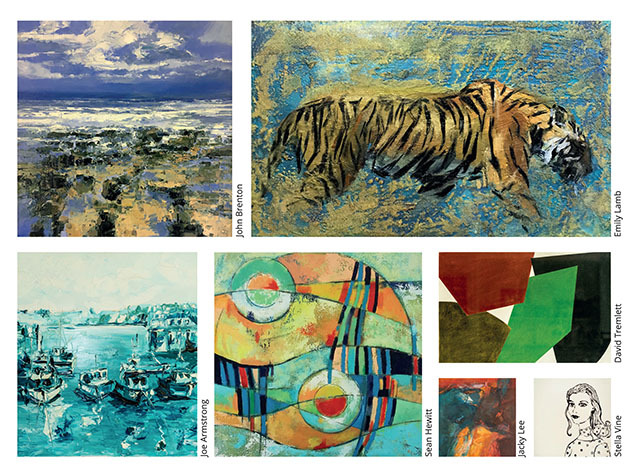 Over 50 well established artists have donated pieces, including Stella Vine, David Tremlett, Amanda Hoskin, John Brenton, Sean Hewitt, Patrick Hughes and Joe Armstrong. All proceeds will be going to Merlin MS Centre, tickets are £5 and include a catalogue, glass of fizz and canapés. Phone 01872 240567 for more information or to book a ticket. Upcoming art classes in Truro Arts’ lovely workshop include screen printing with Dena O’Brien on 16 October, lantern making (in readiness for Truro City of Lights) on Sunday 29 October, and a colour, collage and surface (painting onto aluminium) class with Luke Frost on 20 November. For a full list of workshops visit their website: truroartscompany.co.uk. The fifth North Cornwall Book Festival will be held in St Endellion from 6 to 8 October. There is a real buzz around this flourishing miniature festival, directed by celebrated Cornwall-based author Patrick Gale. This year the festival welcomes an eclectic range of authors and celebrities, including Dame Hermione Lee, Maggie O’Farrell, James Naughtie, journalist Yasmin Alibhai-Brown, and Matt Haig. Alongside talks, interviews, readings and conversations, there will be a programme of workshops covering biography, poetry, lifewriting and art. Children’s and family events during the weekend include the inimitable Sally Crabtree with her Sweetshop of Words, drop-in creative workshops led by The Red Hand Gang, and sofa story sessions for younger children. The evenings see musical performances in the beautiful St Endellion church, including 3 Daft Monkeys, the brilliant smoky-voiced jazz artist Liane Carroll, as well as a magical performance of TS Eliot’s Four Quartets. Exhibitions, bookshop, café and bar complete the experience. 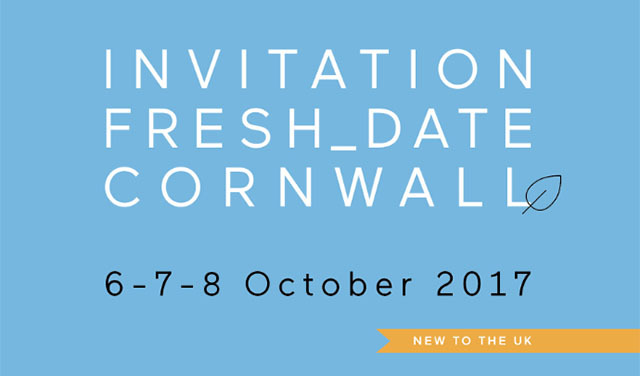 For the full programme of events and to purchase tickets visit ncornbookfest.org. Our Dutch friends from Blao Studio bring their new range of RINGANA fresh beauty products to Cornwall in October. Developed in Austria, the products are new to the UK; high tech yet completely vegan, ethical and with a strong environmental ethos. The RINGANA launch will be held over the weekend of 6 to 8 October at Hawksfield, near Wadebridge, with events at 4pm on Friday 6 and Saturday 7 October, and a drop in afternoon on the Sunday between 1pm and 5pm. For details about the products, and to sign up to attend one of the launch events, visit their website, blaostudio.com. Fun Palace at Krowji is part of Fun Palaces 2017, a free, international celebration of community, bringing people together with arts, science, crafts and technology. Activities and demonstrations will run throughout the day, from 11am to 3pm, led by the community of studio-holders at Krowji, Cornwall’s largest creative hub. The event is free and there is no need to book for the drop-in activities. Twenty artists and makers will be sharing their skills, stories and creative secrets, including jeweller Nicola Bottono who’ll be showing visitors how to apply texture and colour to metal; Caro Beech and Sarah Cooling who will be teaching the techniques of printing and painting; and screen-printer Paul Bawden who’ll be letting visitors have a go at pulling their own print. For more information visit funpalaces.co.uk or Krowji’s Facebook page. Bedruthan’s biggest ever Vintage Festival takes place over the weekend of 7 and 8 October. Expect vintage cars, mid-century and retro furniture stalls, live music and dancing throughout the day and all the antiques, collectables, handmade vintage-inspired prettiness, fashion and beauty you could want. Plus, new for this year, stay for the evening, which kicks off at 7.30pm with drinks and dinner, before live music from Company B.
Friday nights are getting a little bit scary down at Caerhays Beach. The Cornish Cinema Club is showing “Friday 13th” on Friday 13 October, and on Friday 27 October there will be two screenings, “Hocus Pocus” followed by “Nightmare on Elm Street”. Food is available from the café. For more details and to buy tickets see Facebook. 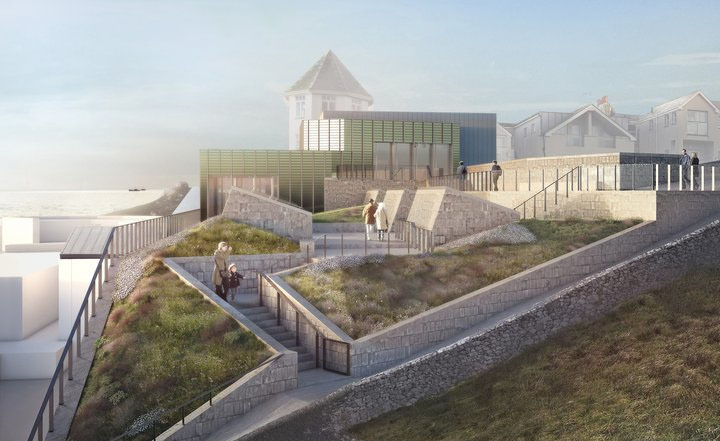 The new look Tate St Ives reopens on Saturday 14 October, with a brand new gallery which doubles the size of the original building. To celebrate the gallery’s transformation, entry is free on 14 and 15 October. For the first time there will be a new permanent “Modern Art & St Ives” display, and the first exhibition is from Rebecca Warren. Doors open at 10am both days, and over the weekend there will be fun family activities, pop up tours, events and talks, and a firework display at 8pm on the Saturday. The ever-popular ice rink re-opens at the Eden Project on Saturday 14 October, and stays open until 18 February. Check out the website for full details. There are general skating sessions, parent and toddler ice-play sessions, a children’s session, and skating lessons are also available. Penguin skating aids can be hired for small children. Skating prices start at £6 for children and £7 for adults. Book online. The annual campaign from Cornish (and global) charity ShelterBox kicks off in October, with the aim of raising money for “people who need light in their lives”. Some of Roald Dahl’s most terrible villains will appear at this year’s Halloweden events. Between 21 and 29 October 2017 there’ll be extra Dahl-themed activities for children visiting the Eden Project. Look out for Mr and Mrs Twit’s tricks, learn how to identify The Witches, visit The BFG’s cave, get put through your paces by Miss Trunchbull, and tunnel into Boggis, Bunce and Bean’s farms with Fantastic Mr Fox. Most activities are included within Eden admission ticket. Ice skating available for an extra charge. The Little Monsters’ Ball Halloween fancy dress disco will be held on Saturday 28 October, £7.50, book online. The inimitable Rogue Theatre‘s Dead of Night Dance returns to Tehidy Woods from 21 to 31 October with all new ghostly stories. Dress for the occasion (wellies and waterproofs) and bring a warm blanket and torch for evening performances. Food and drink available to buy, free face painting, fancy dress very much encouraged. Shows at 2pm, 5pm and 8pm, tickets £8.50. For full details and to book tickets, visit roguetheatre.co.uk. Cornish artist Claire Lucas leads this coastal painting retreat based at The Gurnard’s Head from 23 to 26 October. With a total of 14 hours tuition over the course of the four days, there will be enough time to create a painting to completion at the same time as exploring the local area and relaxing. Claire’s classes are influenced and inspired by the local and the heritage. They are suitable for complete beginners through to experienced artists who are looking for fresh inspiration. Non-residents £135 per person. Residential prices include packed lunches, breakfast and dinner and start from £486 for one person based on three nights’ single occupancy. Contact [email protected] for more information and prices. The Masked Ball is a Halloween show like no other. 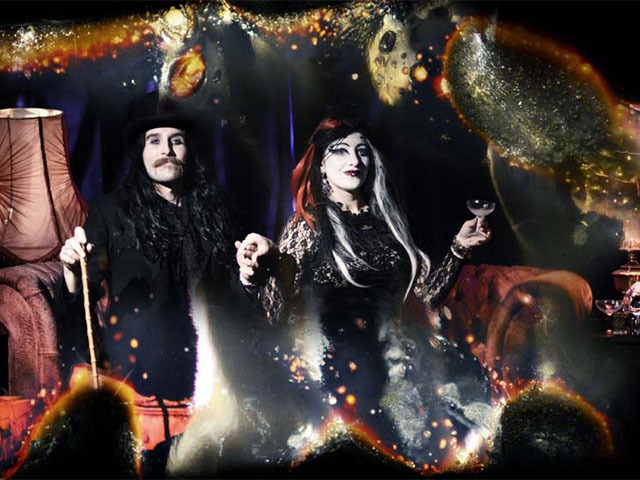 On Saturday 28 October a surreal and strange sideshow of fairground follies, rock ‘n’ roll dancing and freak show craziness comes to Flambards theme park, near Helston which, for one night, becomes Los Flambardos. This year’s theme is the Seven Deadly Sins; each of the deadly sins will be represented by themed venues at what is one of Europe’s largest Halloween parties. 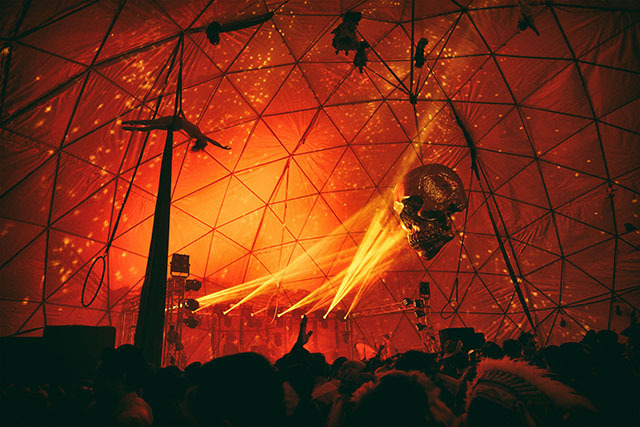 There will be a sterling line-up of DJs, acts and performers across the myriad of dancefloors, dens and hidden bars and all the hell-raising rides will be open at Los Flambardos. 6pm Saturday 28 October to 6am Sunday 29 October. Entry is strictly 18+ only. For tickets and details go to halloweenmaskedball.net. Monochrome is an exhibition of prints and paintings by four local Cornish artists: Gillian Cooper, Catherine Harvey Jefferson, Trudy Montgomery and Paul Wadsworth. All four artists gain inspiration from the textures and forms of granite, windswept hawthorns, the wild seas of the Scilly Isles and the stormy skies of the Cornish landscape. The exhibition will explore the use of black and white, and occasionally one additional colour. Monochrome will be held at The Old Coastguard from 20 October to 8 January, is open to all and free of charge. Over the weekend of 10 to 12 November, The Old Coastguard is hosting a weekend yoga retreat taken by Lief Olsen. Guests stay at The Old Coastguard and are taxied to Lief’s studio in Penzance for the classes which incorporate all the benefits of yoga: stretching, strengthening, and toning the entire body and also cleansing the digestive system and boosting the immune system. The weekend includes two nights dinner, bed and breakfast, four yoga sessions at Leif’s private studio in Penzance and all transfers. Prices from £335 (single occupancy) and £535 (double occupancy). Non-residential rate £100 per person (does not include supper or breakfast). On 10 November, The Old Coastguard is holding a Christmas Craft Fayre. This fair will showcase work by local artists and crafts people, open from 11am -3pm with proceeds going to the Penzance Jubilee Pool Fund. 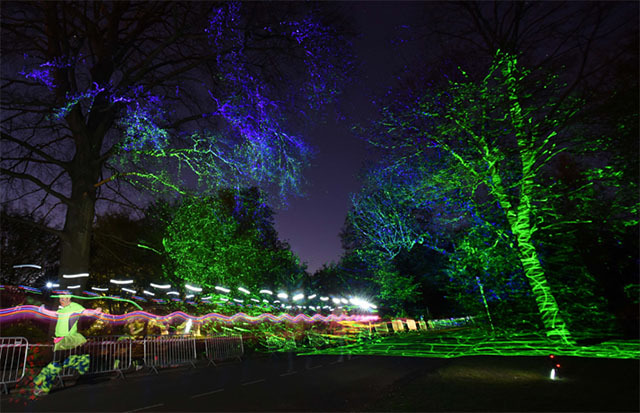 Glow in the Park is a nighttime neon 5km fun run suitable for families and friends, young and old alike. There’ll be six Glow Zones, electrifying lights shows, a Foam Zone, UV Paint Blast Zone and Time Tunnel. All accompanied by music to help get you around the course, whether you walk, jog, run or even dance. Glow in the Park takes place at 7pm on Saturday 11 November at Boconnoc. For full details and to register, visit glowinthepark.co.uk. The Macmillan Christmas Fair will be held at the Eden Project on 15 and 16 November. 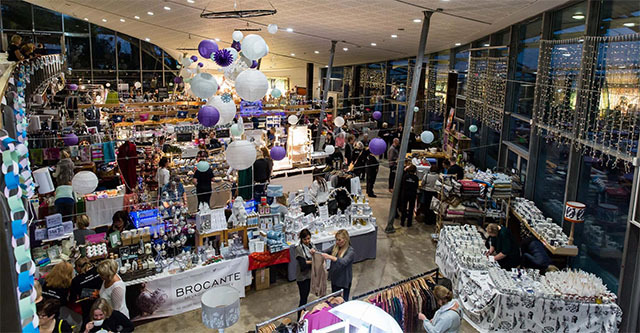 Situated in the Eden Kitchen (between the biomes) there will be a huge range of festive stalls offering gifts, home accessories, stocking fillers, clothing and jewellery. There’ll also be an array of local food producers and suppliers in the Food Hall. Last year, the event raised a staggering £57,000 for Macmillan. The event is organised by volunteers, stallholders donate 15% of their takings, and the Eden Project offers free admission to anyone with a Christmas fair ticket. The preview and shopping evening is from 5pm to 9.3opm on Wednesday 15 November, and the day fair runs from 10am to 4pm on Thursday 16 November. Tickets can be bought online in advance, priced at £25 for the preview evening (includes glass of wine and supper) and £15 for the day fair (includes a light lunch and a drink). 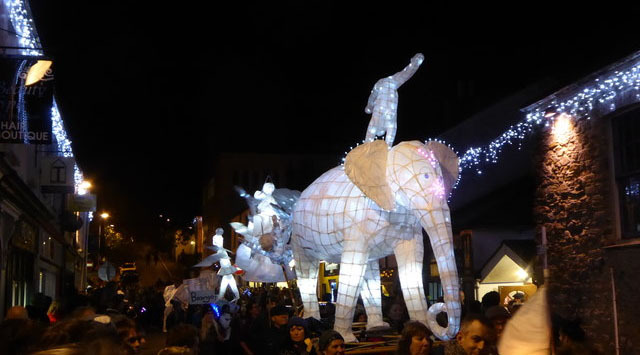 The fabulous Truro City of Lights takes place on Wednesday 22 November this year, marking the start of late night shopping. Each year the event attracts around 30,000 people, with over 100 musicians and dancers, and over 600 lanterns made by local artists, children and students. It’s a wonderful event, fantastic for spectators and an absolute joy to be part of. NB City of Lights is put on by volunteers; if every spectator donated £2, this event would continue each year. If you love this event, please donate by texting ‘COLT17 £2’ to 70070. The gorgeous St Mawes Hotel has a 25-seat Hidden Cinema, which will host live-screenings from the stages of The Royal Opera House and National Theatre this winter. Performances include Alice’s Adventures In Wonderland, The Nutcracker and Hamlet. For a full list of events, visit stmaweshotel.com; special pre-theatre dinner and drinks packages can be booked online. Autumn Movie Nights will be held on Tuesdays and Fridays, £15pp including popcorn, and during half term there’ll be a series of children’s films, £15 for adults, £10 for children. Grand Prix screenings will be held during October, £10pp. 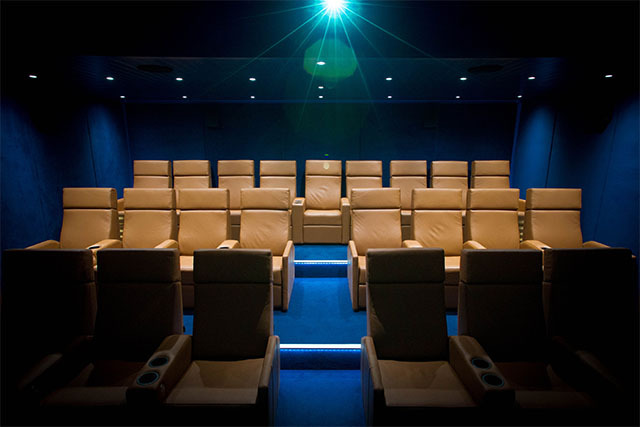 The Hidden Cinema can be hired for your own private screening, from £150 including popcorn. For more information phone 01326 270170 or email [email protected]. The National Trust has a huge number of events at their Cornish properties this autumn. There are historical house and garden tours, beach cleans and fun half term activities, and towards the end of November, Christmas workshops begin. Take a look at the night sky, and take part in the stargazing at Trerice, from 6.30pm on Friday 27 October. Build a bird box and either take it home for your garden or help put it up in some coastal woodland near Port Quin. 10am to 3pm, Wednesday 25 October. Take part in a workshop on birds of prey photography at Cotehele. 10am to 4pm, Saturday 7 October. To find out what’s happening near you, enter your postcode in their website. Let us know about your events by commenting below, or email [email protected].